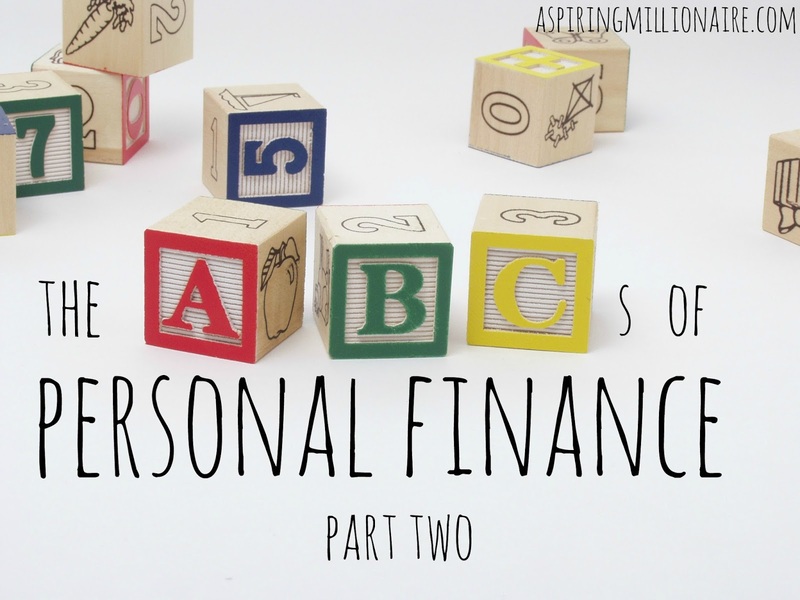 Welcome back to the Personal Finance ABCs, where we're reviewing the simple, yet numerous aspects of personal finance! Last week we covered A-I, and today we'll be tackling J-R.
J is for Judge Not- We all know how the rest of that phrase goes. But just in case: "Judge not, lest ye be judged." The "personal" in personal finance means that everybody's is going to look different. Maybe you think couponing is a waste of time. Others surely don't, and it helps them manage their resources in a fiscally responsible way. Maybe the girl in front of you at the department store just spent $300 on a pair of shoes. You don't know that she's racking it up on credit; it may be a luxury she's been saving up for. Whatever other people choose to spend their money on (or not spend their money on,) keep in mind that it's a very personal decision. Their decisions do not necessarily make them inferior. You certainly wouldn't want someone on the outside looking in to be tearing apart your financial decisions without knowing your circumstances fully. K is for Kijiji- That's a shout out for all the Canadian readers out there. If you're in Australia, you're likely more familiar with Gumtree, and in the US the pop classified site is Craigslist. Whichever site you're using, these can be a great tool for helping your finances. Whether you want to downsize and make some money off of your old "stuff," or are looking for some furniture on the cheap, these sites can help you get there. L is for Leverage- Leverage can be applied to many areas of finance. If you're investing, and decide to do so on the margin (or invest with borrowed money/debt,) you are leveraged. You also use financial leverage when you take out a mortgage or any other type of loan. When you start talking about career, you can use your past work or experience to propel yourself forward financially, as we'll see in letter N.
M is for Money- Obviously, a large part of personal finance is centered around money. But money isn't all there is to it. Money is the tool we use to get what we want, like freedom. It's also the measuring stick we use to gauge our progress. But personal finance is also about psychology. It's about tempering ourselves to live within our means. It's about putting off what we want today so that we will be able to have what we need tomorrow. It's about using money to give ourselves the time we want to spend with family, or giving to causes or people that are important to us. Money is the means in personal finance, but it is by no stretch of the imagination the end. N is for Negotiate- When it comes to personal finance, if you aren't negotiating you're missing out. You can negotiate on near anything where it's culturally appropriate including monthly bills, less-than-perfect product that you're interested in purchasing, and major purchases like homes or cars. Negotiation isn't just for saving, though. It's also for increasing your resources. Negotiating early on in your career can pay off dividends as every salary increase you have after that will be building off of that initial number. If you're already far enough into your career, you can leverage your past work, experience, and contributions to negotiate for a higher raise rather than just accepting what they give you. O is for Opportunity Cost- Opportunity cost is the loss you incur when you make a decision. Almost everything has an opportunity cost. When you choose to keep your money in savings rather than investing it, the opportunity cost is the the loss of interest you could be making off of those investments. When you choose to invest rather than keeping it in savings, the cost is the opportunity to have access to those liquid funds when/if you need them. Work has opportunity costs, as well. If you choose to cut your hours, the opportunity cost is the money lost. When you choose to take on more hours, the opportunity cost is the time lost where you could have been doing other things. 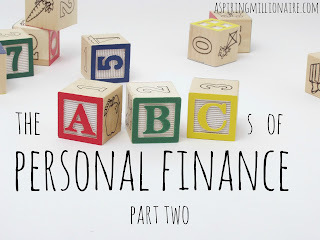 P is for Planning- There is so much planning in personal finance. When you make a budget, you're planning your spending for the month. But the real power of planning comes in when you plan how you'll save over the long-term. A great way to plan is to set a long-term goal, and then break it into manageable chunks by year, month, or even week. Q is for Quicken- Or Mint. Or YNAB. Or any other personal finance software. If paper and pen isn't serving you well, digital options abound and can help you keep track of and maintain a clear picture of where your finances are. Personally, I'm a bit of a cheapskate in this department and have set up my own Excel spreadsheet. Use whichever tool works best for you. R is for Ratio- Ratios are commonly (though not universally) used to allocate money in personal finance. If you are investing, you may allocate a certain percentage of your investments to specific types of investments. For example, younger people tend to have a higher percentage of stocks in their holdings, and then a lower percentage of bonds or other less volatile investments. As people get older, they tend to shift this ratio, putting a higher percentage in bonds and lowering their exposure to stocks. Ratios can also be used in budgeting. You may want to save a certain percentage of your income, and spend no more than a specified amount on housing, food, etc. Be sure to join us next Tuesday for the final installment; letters S-Z!